The DA shadow minister of justice wants the public protector to appear before parliament before she appears before the Concourt. DA shadow minister of justice and constitutional development Glynnis Breytenbach says she has been “reliably informed” that Public Protector Busisiwe Mkhwebane has shown “disdain for the legislature and its constitutional powers and responsibilities” in a letter submitted to parliament. 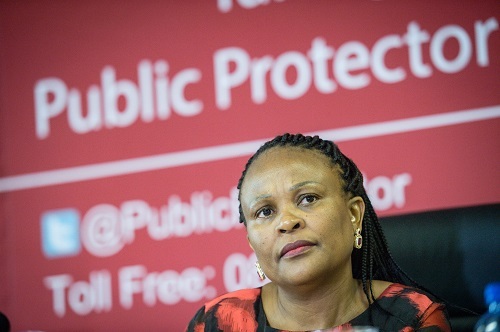 The public protector has until tomorrow to file papers if she is to challenge a ruling by the High Court in Pretoria that she must pay some of the costs after the court set aside her recommendations regarding the Absa-Bankorp matter. In a report issued in June 2017, Mkhwebane recommended that the Special Investigations Unit (SIU) should reopen an investigation into a bailout given to Bankorp (which Absa subsequently bought) during apartheid. She also ordered Absa to pay back R1.25 billion. In February this year the court set aside her report as well as her remedial action and ordered that she must pay back 15 percent of the legal costs incurred by the South African Reserve Bank (Sarb), as well as Absa’s costs on an attorney and client scale. The Constitutional Court granted Mkhwebane the right to challenge the constitutionality of the personal cost order but not the findings that her recommendations should be set aside. According to Breytenbach, “these findings are central to the DA’s call for parliament to hold an inquiry into the fitness of the public protector to hold office”. The constitution says the public protector can be removed for “misconduct, incapacity or incompetence, because of a finding to that effect by a committee of the National Assembly” or due to the “adoption by the Assembly of a resolution calling for that person’s removal from office”. The DA wants these clauses applied in an attempt to see parliament hold Mkhwebane accountable for her alleged misconduct. Mkhwebane is set to appear before the Constitutional Court on November 27. If Breytenbach has her way, though, “she will have to appear before parliament long before that”. “No more delays can be tolerated,” she added. In June, the DA submitted a formal request to the Speaker of the National Assembly, Baleka Mbete, to expedite proceedings against Mkhwebane. Attempts to contact the office of the public protector were unsuccessful at the time of publication of this article.